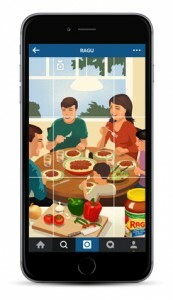 I can’t find my favorite RAGÚ® brand product: can you help me? We apologize for the difficulty you’re having locating RAGÚ® sauces in the U.S. If the product in question is still made, it can be made available to any store willing to carry it. Please inform your store manager that you are interested in the product. Urge them to contact their distributor, so they can carry it on their shelves and make it available to you and other consumers. 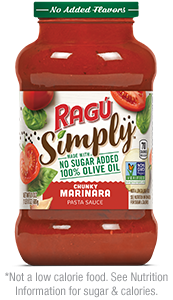 To use our online product locator, click here and follow the instructions using your zip code to find the nearest store selling this RAGÚ® Sauce variety. If the product you are looking for isn't listed in the product locator, we're sorry but it has likely been discontinued. What are your latest RAGÚ® Sauce promotions? Any current promotions for RAGÚ® Sauce will be featured on our homepage. Please click here to browse the site. Do you have any recipes using RAGÚ® sauce? You can find some great recipes and a wealth of information on our website. Simply click here to browse a selection of recipes using RAGÚ® Sauce. Who at RAGÚ ® can I contact about making a donation or sponsorship? Thank you for contacting Mizkan America, Inc. with your request for support. We recognize that while we’re building and strengthening our internal community, we also need to remember to look outward, too. Our business is food. So, we focus on opportunities to feed the hungry and increase those all-important shared meal occasions. We also work to support healthy, happy individuals and families in the communities where we live and work, always with a view to better supporting those consumers who support us. In terms of corporate sponsorship, we have already selected charities that represent our focus areas and have allocated our charitable giving for this year. Should you wish to share a proposal for brand-level sponsorship, you may send it to Raguconsumersupport@mizkan.com. We will share it with the brand teams and they will get back to you should they be interested in learning more. Is there gluten in RAGÚ® sauces? Do you have a list of your gluten-free varieties? Common ingredients that may contain gluten are rye, wheat, oats, barley, noodles and pasta prepared with any of the previously mentioned grains. HVP and TVP flavorings are likely to contribute gluten as well, however, if they contain any gluten, the source would always be listed in the ingredient statements. Since product formulations change from time to time, we do not have a printed list of products that identifies those products that contain specific allergens or gluten. The best advice we can give you is to check the ingredient list on the label. Ingredient allergens as defined by FDANSWER: peanuts, tree nuts, soy, fish, seafood, wheat, eggs, and milk or dairy, as well as any ingredient that may contain gluten are always listed on the label. If gluten is present, it is clearly listed in plain language on the ingredient label (i.e., wheat flour, rye, barley, oats, and malt). Malt is a barley-based ingredient. We do not publish a list of gluten-free varieties. Therefore, we suggest reading all ingredient labels carefully. As always, if you cannot determine whether the product contains the ingredient in question, we recommend that you don't use it. How should my jar of RAGÚ® Sauce be stored? Always store your unopened jar of RAGÚ ® sauce in a cool, dry place. We recommend that you use the sauce by the “Best if Used By” date. We should note that refrigerating unopened jars will NOT lengthen shelf life. Importantly, DO NOT USE SAUCE IF SAFETY BUTTON IS RAISED BEFORE OPENING. Tomato-based sauces should be used within five (5) days after opening with proper refrigeration. Cheese-based sauces should be used within three (3) days after opening with proper refrigeration. How do I know if the product I have in my pantry is still safe to eat? The "Best If Used By Date" is stamped on the top of every jar of RAGÚ ® sauce. This is the date that assures the product's optimum quality and freshness. We recommend that you use your product by this date. Is the RAGÚ ® product packaging recyclable? I have a great new product idea for RAGÚ® Brand. Where can I submit it? Unfortunately, our policy does not allow us to accept any ideas/suggestions for new products varieties or promotions. How can I find out about jobs at the company that makes RAGÚ® Sauces? At Mizkan America, Inc. we currently do not maintain an online listing of open employment positions. Should you find a Mizkan America, Inc. job opening through an employment search portal (Indeed, CareerBuilder, etc. ), you should follow the application directions contained in that posting. If you would like to reach out to Mizkan America, Inc. directly about employment opportunities, you may email your resume with a cover letter to: Recruiter@mizkan.com (for U.S. positions ONLY). After you have applied for a publicly listed, open position, your resume will be reviewed by the recruiter assigned to that position. If an appropriate fit is determined, your resume will be forwarded to that hiring manager for review. Due to the number of resumes we receive, it is not possible for us to respond to each applicant individually. If your experience and qualifications are a good match for the criteria of the posted position, you may be contacted at some point during the hiring process. In the meantime, we wish you much luck with your job search.